DBS is a strong and proud part of Singapore’s banking heritage. The last four years, they have pursued a clear customer-focused experience innovation strategy. 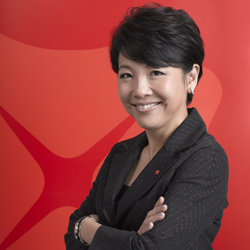 AdAsia had the opportunity to hear from Pearlyn Phau, Managing Director & Deputy Group Head of Consumer Banking Group and Wealth Management, how DBS enables innovation throughout the organisation, in order to be able to cope with changing customer expectations. We met Pearlyn during the Adobe Experience Forum in Singapore, a forum where Adobe’s most prominent customers showcase their marketing strategies. The first question we asked was: why is it important for DBS to change? Pearlyn first highlights the fundamental changes that the current generation has developed as a result of a lifestyles that is primarily centred around mobile. When did the change start? Was this a top down decision by the senior management or was it the customer driving the change? But isn’t digital in and of itself cluttered and contributing to the problem? Sometimes these strategies lead to backlash. “It is true that digital marketing is important but to me, it is also about the mix. We constantly try to optimise our BTL and ATL budgets so that we remain top of mind and at the same time, we interact the right way when there is any backlash. Have there been any difficult decisions? What is the role of marketing in the current DBS process? Would you say that everyone is a marketer at DBS? How is this changing the relationship with marketing agencies? “We are changing and transforming. Agencies cannot always think from within, whereas our own employees can do this and have to do this. Our agency partners see this and are under pressure to change their service offering and even business models. How do you keep customers close to you, when no one actually wakes up in the morning excited about making a payment? How do you take decisions? How do you e.g. take a decision on whether to integrate chatbots and AI? You are very much focused on customer experience, what comes after that? What is the next field on which businesses should focus to stay relevant? DBS is very vocal about the profound changes they have imposed on themselves, starting at the customer experience level. With goals like ‘creating a start-up culture’ and ‘everybody is a marketer’, they clearly set themselves a high bar. The future will tell if they will stay relevant in the fast changing world of finance, with potential disruptions specifically coming from fintech start-ups. Watch this space.